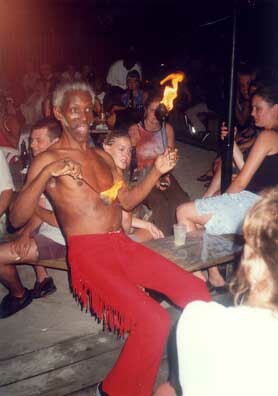 The after dark scene in Barbados is as varied and exciting as the sun filled days. Whether it is a visit to one of the friendly rum shops or a spectacular dinner show you will find just the right affair. Anytime of the year you come to visit Barbados you will find the nightlife filled with variety and excitement. There were some 100 drinking houses in Bridgetown alone by the 1650's. The scene varies from one club to another. There are live bands and/or DJs playing Calypso, Reggae, R&B and Contemporary. The scene starts up at about 9 or 10 pm and is well underway by 11 pm until the wee hours of the morning. On Sandy Beach my listen to live music at the Carib Beach Bar. A Friday night hangout with locals and visitors is at Mogo's. Live jazz every other Saturday night can be found at 39 Steps Win Bar. A daily happy hour is celebrated at The Boatyard. The Waterfront Cafe sports Dixieland Jazz and has a menu featuring Caribbean and seafood dishes. Harbour Lights is a very poplar open-air night spot. It is located on the beach and features a Monday night extravaganza. Fire Eating is one of the featured events. They also sponsor beach parties which start around 5 pm which are popular with the 20 and 30's crowd. The Mews on 2nd Street in Holetown sponsors live jazz on Friday nights and is primarily known for its food. Olives Bar and Bistro is a popular gathering place and known for its elegant upstairs bar. The Coach House has sports events via satellite TV and features a live steel band on some nights. The brilliantly color native attire along with the lush tropical settings gives one a feeling of liberation and the nights will go on till dawn. The nightlife spots are many and varied in Barbados and most feature very late night party times that cater to the visitors. However... there are other sports going on in Barbados at night. The sea at first may appear to become black and forbidden at night. 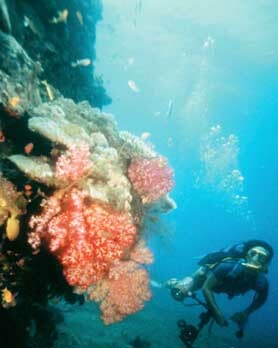 With all the colorful corals and sea life hidden down deep. How about a quiet - dry submarine cruise? The Atlantis Adventure offers submarine cruises departing around 6 pm. 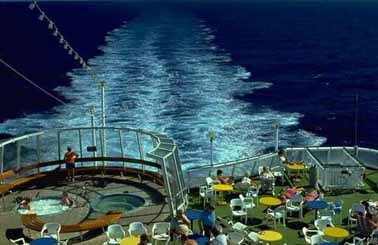 The ship has 22 spotlights to illuminate the colors of the underwater gardens and shipwrecks at night. Call for information about this unusual excursion: (246) 436-8929. The M.V. Harbour Master offers night-time party cruises. You are treated to a live band, spectacular floor show and a fantastic dinner buffet. For more information on Harbour Master Cruises call: (246) 430-0900.